A long-neglected aspect of Gen. Robert E. Lee’s Northern Campaign in June and July 1863, the Confederate army’s harrowing retreat from Gettysburg is beginning to receive the attention it deserves. This was a high-stakes event, the outcome of which would have a profound impact on the progress of the war. In 2005, Kent Masterson Brown published an incisive study called “Retreat from Gettysburg: Lee, Logistics, & the Pennsylvania Campaign.” As the title implies, this work emphasized the logistics of moving a large army in unfamiliar and unfriendly territory in an attempt to reach safety at the end of an arduous campaign while being closely pursued by the enemy. 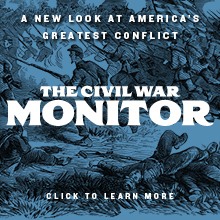 When Civil War armies confronted each other, ordinarily the infantry was at center stage. When armies were on the move, however, the cavalry generally played the more important role. It screened and protected a marching army, and gathered information about the opposing force’s location and intentions. “One Continuous Fight: The Retreat from Gettysburg and the Pursuit of Lee’s Army of Northern Virginia, July 4-14, 1863” by Eric J. Wittenberg, J. David Petruzzi and Michael F. Nugent highlights and scrutinizes the Union and Confederate cavalries’ role in the aftermath of the Battle of Gettysburg, and factors in the results of cavalry engagements in the overall outcome of the pursuit of Lee’s army. Mr. Wittenberg has published a number of studies on Civil War cavalry actions (most recently “Rush’s Lancers” and “Jeb Stuart’s Controversial Ride to Gettysburg”), and is recognized as one of the foremost scholars on this subject. Mr. Petruzzi also specializes in cavalry matters, and authored the Jeb Stuart book with Mr. Wittenberg. Mr. Nugent, a newcomer to the publishing field, brings credentials of military service as an armored cavalry officer. The benefit of three authors collaborating is reflected in the extensive research conducted to produce this study. In the foreword, Civil War writer Ted Alexander reviews the lean historical record on this subject, and cites the heavy casualty count for cavalry during this campaign. Military historian Noah Andre Trudeau, in the preface, laments the absence of “the full Lee versus Meade story.” He cites the lost opportunities that Lee and Union commander Maj. Gen. George G. Meade experienced during the post-Gettysburg period – not the least of which occurred during the retreat. In essence, he frames the issue that is at the heart of the examination undertaken in “One Continuous Fight,” that is, whether Meade put forth sufficient effort to attack and destroy Lee’s army. In the introduction, the authors point out that the cavalry of both sides bore the brunt of the fighting during the retreat. The title is derived from a Confederate cavalryman’s description of the march from Gettysburg as “one continuous fight.” The objective, therefore, was to link more than a score of cavalry engagements, and to explain the impact of each on the outcome of the Army of the Potomac’s pursuit of the Army of Northern Virginia. Several of these engagements occurred at locations that may not be familiar to some, such as Monterey Pass, Williamsport, Funkstown, Hagerstown, Boonsboro and Falling Waters. In the context of Lee’s attempt to escape with his army still relatively intact, however, each of these battles or skirmishes had a bearing on the eventual outcome. The authors take the reader on a wild ride through the Pennsylvania and Maryland countryside following lengthy wagon trains and the opposing armies. Conditions were for the most part extraordinarily poor, with heavy rains and inferior or nonexistent roads. The Confederate train, filled with thousands of men wounded at Gettysburg, sustained repeated attacks along the route, yet somehow most of the wagons arrived at the Williamsport destination. Lee’s army, already reduced by about 28,000 casualties at Gettysburg, would suffer thousands more losses from deserters and those captured along the way. The Confederates had two major terrain obstacles. Initially they had to get across South Mountain safely, and eventually ford a rain-swollen Potomac River. In both cases, they relied on Stuart’s cavalry to keep the Union army at bay in the attempt to have Lee’s forces reach safety. Whether fighting in the mountains or clashing in the valleys, the Union and Confederate cavalries showed their mettle. These troopers conducted operations with little time for rest and paltry rations. The authors introduce several of these heroes, citing their backgrounds and accomplishments. Many would be wounded or killed in combat along the way, their makeshift graves dotting the landscape. Particularly captivating is the description of the classic struggle between Union cavalry commanders Brig. Gen. John Buford and Brig. Gen. Judson Kilpatrick on the one hand and the forces Brig. Gen. John Imboden was able to cobble together on the other. They fought for possession of the Confederate wagon trains that had successfully reached Williamsport. The authors point out that the outcome of this battle was crucial to the fate of Lee’s army. While the successive cavalry battles provided the excitement, the pending confrontation involving opposing infantry supplied the drama. As both armies settled near Williamsport, Meade and Lee were left with the wrenching decision of whether to reprise the bloody conflict at Gettysburg. Detailed discussion of the military and political ramifications of potential choices makes for fascinating reading. The authors assess the respective commanders’ capacity to accept responsibility and manage stress under these trying circumstances. While their commanders pondered the options, a sizable majority of Union officers and enlisted men who went on record expressed a desire to attack the enemy and bring an early end to the war. A feature of this study is the extensive research and use of primary sources to authenticate the findings presented. Facts and statements are documented with the words of participants recorded in letters, memoirs and official correspondence. This plus the inclusion of ample maps, photos and illustrations enhances the feeling of being close to the action. An appended order of battle aids in identifying military units, and the comprehensive bibliography will permit further investigation. Given the depth of research, it is surprising that this study does not include a number of reports dated July 9-11 from civilian and military scouts of the Army of the Potomac’s intelligence staff known as the Bureau of Military Information. These documents, located in files at the National Archives and published in available sources, were from BMI personnel who reconnoitered Lee’s army in the vicinity of Hagerstown and Williamsport and provided details of its location, disposition, defensive preparation, supply efforts, movements across the river, and the conditions in the area. These reports were by far the most detailed Meade had available about enemy plans and activities. Also note that the figure cited by the authors of 12,000 Union cavalry at the Battle of Brandy Station should read just under 8,000, and recent scholarship provides satisfactory evidence that Imboden’s cavalry brigade had a strength of 1,300 to 1,400 rather than the 2,245 cited. These changes for the record do not detract from the exceptional research accomplished in this study. Some bonuses are two separate driving tours that afford the opportunity to follow in the footsteps of the retreating Confederate army and its wagon trains along the hazardous routes they followed. The length involved along these somewhat parallel routes (about 50 and 65 miles respectively), that begin and end in the same locations, may dictate taking one route forward and the other in reverse to save time. A listing of GPS Waypoints for the Wagon Train of Wounded Driving Tour provides additional guidance. Those with an interest in the critical 10 days after the Battle of Gettysburg will welcome this essentially eyewitness account based on voluminous personal descriptions and recollections. “One Continuous Fight: The Retreat from Gettysburg and the Pursuit of Lee’s Army of Northern Virginia, July 4-14, 1863” should be at the top of everyone’s Civil War shopping list. Thomas J. Ryan of Bethany Beach is past president of the Central Delaware Civil War Round Table. That’s a very favorable review, and I couldn’t be more pleased about it. Hopefully, there will be more. Thanks, Tom, and I’m glad to know you enjoyed the book. Hat tip to Kevin Levin for bringing this to my attention (please be sure to read the interesting tributes to Alan in the comments to Kevin’s post). I had an opportunity to meet Alan and spend some time with him over the years. We did several programs together over the years, and he was a regular attendee at Gabor Borit’s annual Civil War Institute at Gettysburg College. A number of years ago, Alan had a devastating stroke that left him largely wheelchair bound. Although his body had failed him, his mind remained active and he retained a keen interest in the Civil War. Even after the stroke, he continued to come to CWI, sitting on the aisle in a special spot reserved just for him. Alan passed away on July 27 at age 85. I particularly enjoyed talking with him. For one thing, he was an attorney with decades of experience, so we spoke the same professional language. Alan was an NLRB arbitrator, and he thoroughly enjoyed that role. In addition, he was an accomplished and universally respected Civil War historian. His history of the Iron Brigade is considered to be one of the great classics of Civil War literature, and for good reason. It was a great book that helped to pave the way for contemporary unit historians; many still use its approach as a model for the modern unit histories. And, most importantly, Alan was always willing to chat with anyone who came by, and he was unfailingly kind and generous to all. Through it all, he remained humble, friendly, and always approachable, even as his illness sapped his productivity as a Civil War historian. As for me, his work had a profound impact on me. 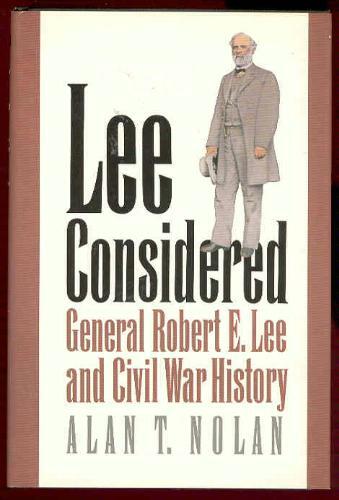 In 1991, his seminal work, Lee Considered: General Robert E. Lee and Civil War History. This book, which has spurred vast amounts of controversy since the day it was published, broke new ground: it contradicted the Lost Cause mythology and instead argued that Robert E. Lee was a human being filled with ordinary foibles who was not perfect. Writing a brilliant legal brief, Alan argued that Lee was not a god, but just a man, imperfect and eminently human, and prone to mistakes and even to some unpleasant and not altogether likable personality traits. In short, the book was a brilliant and ultimately revolutionary work that had a great impact on the world of Civil War history. I read the book when it first came out and was blown away by it. And I remembered it. Years later, when I decided to assess Phil Sheridan’s role in the Civil War, I used Alan’s Lee Considered as the model for my book Little Phil: A Reassessment of the Civil War Leadership of Gen. Philip H. Sheridan. I very much modeled my approach on Alan’s and I was unabashed about saying so in the introduction to the book. In a lot of ways, Little Phil was my personal tribute to Alan and his work, and like Lee Considered, it’s generated a great deal of controversy. Like Alan’s book, readers either love it or they hate it; I frankly don’t care whether they love it or hate it. If readers reassess their opinions about Sheridan, then I will have accomplished what I set out to do. Alan took very much the same approach to his work, and to the same effect. I owe Alan Nolan a great debt, and I will miss him. Rest in peace, Alan. While your presence will be missed, your legacy will live on. They say that bad things come in threes. Our little Civil War community has lost Deborah Fitts, Prof. John Y. Simon and now Alan Nolan in a period of just three weeks or so. Let’s hope that there will be no more losses for a while. Our ranks are thin enough. I’m back home after Mother of All Gettysburg Seminars. It was a jam-packed few days. Here’s a run-down on the event. WEDNESDAY: I put half a day at the office and hit the road at little after noon. It took me 5.5 hours to get to Chambersburg. JD beat me there–his trip is shorter than mine–so he was waiting for me. We had dinner together, and then there was an opening session. After it was over, we went to visit the traveling bookshop set up by old friend Jim McLean of Butternut and Blue. I spent WAY too much money on books this trip. It was good to see folks such as Ed Bearss, Jeff Wert, Tom Clemens, Blake Magner, Sean Dail, David Martin, Andy Waskie, Patrick Falci, and others. I also finally got to meet fellow blogger Ethan Rafuse. I did some client work and got to bed at a reasonable hour. THURSDAY: JD and I had a full-day bus tour of a portion of Stuart’s Ride. It’s basically the tour at the end of our book Plenty of Blame to Go Around: Jeb Stuart’s Controversial Ride to Gettysburg. We had about 20 people, and while we’ve got this tour down to a science at this point, it makes for a LONG day. I got to see the new Custer monument at Hunterstown, which is pretty nifty. We left at 7:00 and got back to the hotel in Chambersburg at 5:30. There was a dinner and then a bunch of additional sessions, including a panel discussion on George Gordon Meade that included Jeff Wert, Kent Masterson Brown, Ethan Rafuse, Rick Sauers, and me. That was lots of fun. FRIDAY: Friday was a full day of lectures. Neither JD nor I could bear the thought of sitting through them on a nice day, so we went and did our own thing. We left early and headed to the Monocacy National Battlefield, as we were going to follow Jubal Early’s route to Washington. We stopped into the new visitor’s center there, and, having forgotten that my pocket had a big hole in it, lost my digital camera. Fortunately, the ranger found it and kept it for me, but it meant I didn’t have a camera that day, which made me mad. We followed the Georgetown Pike into DC, and then went to Rock Creek Park. Ranger Ron Harvey gave us some useful information there, and we then went and found the nearby and well-preserved Fort DeRussy, which was one of the circle forts around Washington, and which is remarkably well preserved. It saw action during the attack on Fort Stevens. From there, we went and found what’s left of Fort Stevens. There’s not much there, but it was nevertheless cool to see the spot where Lincoln stood (which is not where the marker is, but rather where the dumpster is–not very dignified). From there, we went to nearby Battleground National Cemetery, which holds the remains of 41 men killed during the fighting for Fort Stevens, as well as four handsome regimental monuments. It’s the smallest national cemetery, but a cool site nevertheless. After lunch, we went to Abraham Lincoln’s cottage on the grounds of the Soldier’s Home. We visited the nearby national cemetery, and visited the graves of Generals Henry J. Hunt, John A. Logan, and David S. Stanley, and then we had our tour of Lincoln’s cottage. It was a wonderful tour, and, quite coincidentally, guided by an alum of my alma mater, Dickinson College. From there, it was back to Monocacy to retrieve my camera, and then back to Chambersburg for the annual auction to raise money for battlefield preservation. I donated a tour for four of Brandy Station, Kelly’s Ford, and Trevilian Station. It raised the largest amount of money of the night, which I felt good about. SATURDAY: On Saturday morning, JD and I had the morning free, so we bummed around Gettysburg for a while. After a lap around the battlefield, we went to the bookstore at the Farnsworth House, where I once again spent too much money. We also went to the Antique Center downtown, and spent even more money on books. After lunch, with JD’s help, I led a tour of Merritt’s attack on South Cavalry Field, Farnsworth’s Charge, and Fairfield for a group of 7. The group included a woman named Rae Anne McDonald, who is related to Elon J. Farnsworth, which was very cool. It was very hot and somewhat sticky, and I was drenched with sweat by the time we finished the tour. Climbing the hills was a real challenge with my ongoing Achilles tendonitis problem, but I forced myself to do it. After the tour, we left the group–none of us could bear the thought of yet another tour of the new visitor center at Gettysburg (which I’m not really terribly impressed by anyway), so JD, Jeff Wert, and I traveled to Fairfield to meet Dean and Judy Shultz and our friends Dave and Carol Moore for a fabulous dinner at Dave and Jane’s Crab House. We had several dozen Maryland blue crabs and an amazing meal, and we were all blown away by JD’s session of truly prodigious eating (if I ate the way he does, I would weigh 600 pounds). We got back late, but in time for the final session. The problem was that there was a bad combination at the hotel: a hillbilly wedding with lots of drunken rednecks and a large batch of mostly unsupervised teenage boys run amok. It made for quite an evening. The hotel, by the way, was a dump. The toilet in my room–probably the second most important thing in a hotel room after the bed–was broken and had to be flushed by taking the lid off the tank and pulling up the flap until it was finally fixed yesterday. Ted got lots of complaints about the hotel, so hopefully, this was the last time it’s going to be used. SUNDAY: After a leisurely breakfast, we caught the last couple of sessions, followed by a final panel on Stuart in the Gettysburg Campaign featuring J.D., Jeff Wert, and me. It was a good wrap-up to the weekend, and then I hit the road. I’m glad to be home–if not excited about going back to work tomorrow–and also glad that I’m pretty much done with my conferences for the year–I have only one left, and it’s in November. I’m pretty burned out on them, and I’m definitely burned out on the travel, and just ready to enjoy being home for a while. Tomorrow, it’s back to normal. Tomorrow at noon, I’m once more on the road, this time to Chambersburg for Ted Alexander’s Mother of All Gettysburg Seminars. On Thursday, JD and I are leading a full day tour of Stuart’s Ride sites. On Friday, we’re going to Washington, D.C. to see sites associated with Jubal Early’s 1864 raid on Washington. Saturday, I’m leading a tour of Farnsworth’s Charge at Gettysburg, and then on Sunday morning, JD, Jeff Wert, and I are doing a panel discussion on Stuart’s role in the Gettysburg Campaign. This is a real lollapalooza of a Gettysburg program. Historians include, but are not limited to, Ed Bearss, Jeff Wert, Ethan Rafuse, Kent Brown, Joe Bilby, Blake Magner, Rick Sauers, and Dr. Richard Sommers. It’s going to be quite an event. I will have a detailed report on Sunday night when I get home. The 4th Pennsylvania Cavalry on July 2, 1863. Earlier today, there was some discussion on the Gettysburg Discussion Group about the role of the 4th Pennsylvania Cavalry at Gettysburg on July 2, 1863. By way of background: Brig. Gen. John Buford’s First Cavalry Division was ordered to leave Gettysburg and march to Maryland, where it would spend the rest of July 2 and all of July 3 guarding wagon trains and keeping the Army of the Potomac’s lines of supply, communications, and retreat open. By about noon, Buford’s two brigades had left the battlefield, leaving the left flank of the Army of the Potomac’s position in the air. Responding to calls by Maj. Gen. Daniel Butterfield, the army’s chief of staff, to send additional cavalry to guard that flank, Maj. Gen. Alfred Pleasonton, the commander of the Army of the Potomac’s Cavalry Corps, sent a single regiment, the 4th Pennsylvania Cavalry, to fill the role that had kept two brigades occupied for most of the morning. The question posed was what was the precise mission of the 4th Pennsylvania Cavalry on July 2, and when did it arrive on the Union flank. As for the assignment, the 4th PA was supposed to provide screening for the left flank of the Army of the Potomac’s position. Butterfield’s note to Pleasonton of 12:50 states: “the patrols and pickets upon the Emmitsburg road must be kept on as long as our troops are in position.” OR 27, pt. 3, 490. A few minutes later, Butterfield wrote, “[Meade] expected, when Buford’s force was sent to Westminster, that a force should be sent to replace it, picketing and patrolling the Emmitsburg road.” Ibid. From these two dispatches, it’s clear that the 4th was supposed to perform the same duties that Col. William Gamble’s brigade of Buford’s division had been performing before it was pulled out. Gregg sent the 4th Pennsylvania Cavalry. Its numbers were insufficient to cover the entire flank, and it is unclear when these men arrived in the area. The Pennsylvania horse soldiers had come to Gettysburg by way of Hanover after an all-night march, and they were exhausted. By the time they arrived, it was too little, too late, as Longstreet was about to unleash his sledgehammer blow on the Army of the Potomac’s left flank. It is unclear where the responsibility for the failure to replace Buford’s departing troopers lies, but it ultimately must fall upon the Cavalry Corps commander, Pleasonton, for failing to recognize the need to protect the army’s position with a cavalry screen. The Union left flank was left unprotected, leaving it open to the attack that would come that afternoon. This paragraph appears on p. 71 of the magazine. Lt. Col. William E. Doster of the 4th Pennsylvania Cavalry wrote in his after-action report of the battle: “At noon of the 2d of July, I was ordered to report with my regiment to Major-General Pleasonton, and was stationed in rear of a battery in the center of our line by a captain on General Pleasonton’s staff. Upon reporting to General Pleasonton in person, I was ordered to return to General Gregg, there being sufficient cavalry at that point, which was done.” (OR vol. 27, Pt 1, 1058-9). …Gregg ordered us into a field of clover on Rock Creek, between Hanover and Taneytown roads. At three I was ordered to accompany a staff officer of General Pleasonton’s with my regiment. We hastened through the crowded roads to what I afterwards learned was Little Round Top, in rear of some artillery, McGilvery’s artillery brigade of Sickles’s corps, where I left my regiment and went with my guide to Pleasonton for instructions. This was the headquarters of our army. The house was a small cottage on the left of the Taney Town Road, sheltered somewhat by the hill above. Outside were many staff officers and orderlies. Within was Butterfield, Meade, and Pleasonton. They occupied a room that contained the ordinary bedroom furniture of an ordinary Pennsylvania farmer. Their gentlemanly manner and brilliant uniforms contrasted strangely with the surroundings. Pleasonton begged my pardon for having made me ride so far. There was no need of exposing the cavalry in front. I should rejoin Gregg on the right and tell him to take good care of it. My orderly’s horse was struck by a shell here. I rejoined my regiment, who were very glad to get out of the fearful rain of shell which, directed to the caissons in front of them, dismounted a number of them. On my way back noticed Sickles on a stretcher, smoking a cigar. They said his leg had been shot off in the last charge. This is giving the ‘Solace Tobacco’ a new meaning. By the time I reached Gregg he was just going into camp in the clover field above mentioned. The men were just leaving their horses to run at random to graze and sitting down to make coffee, when a long Rebel infantry skirmish line issues from the woods and advances towards us, while artillery on the edge of the woods reach us with shells. We get our artillery limbered up again, throw out a stronger line, drive them back, and then, in sight of one another, take supper, for the first time since we left Edwards Ferry, with some degree of comfort….. Thus, the answer is that this lone regiment arrived as Longstreet’s assault was getting ready to step off, far too little and far too late to make any difference at all. Then, the Pennsylvanians were pulled back out of line and sent to re-join the rest of Gregg’s division. They played no role at all in the repulse of Longstreet’s assault. It’s an interesting question as to what Pleasonton really hoped to accomplish, and also why he failed to send a proper force to screen the left flank in a timely fashion. Had he done so, it’s entirely possible that Sickles would not have moved his 3rd Corps out to the Emmitsburg Road plateau, where his command fought valiantly, but was largely sacrificed to Longstreet’s blow. Pleasonton never said, so we will never know. It’s just one of many egregious failures by him during the Campaign, and undoubtedly the most costly in terms of human life. 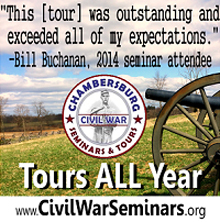 On Wednesday afternoon, I leave for Ted Alexander’s Mother of All Gettysburg Seminars in Chambersburg. On Thursday, J. D. and I are leading an all-day tour of Stuart’s Ride, beginning at Westminster and then heading to Union Mills to Hanover, on up to Carlisle, and then to Hunterstown before calling it a day. On Saturday, I’m leading a walking tour of Farnsworth’s Charge (which is going to be interesting: I have a relative in the group, and I also am dealing with a very painful case of Achilles tendonitis in my right leg, and going up hills is a new adventure in pain just now). We have Friday completely off. There’s a whole day of lectures, but neither of us feels much like spending the day listening to lectures when there are things to be seen. We were supposed to do some battlefield stomping on the first day’s battlefield at Gettysburg with former Licensed Battlefield Guide Keith Toney on Friday, but Keith had something come up which will prevent him from making it, so we had to identify and embrace Plan B.
Consequently, J.D. and I have decided we’re going mobile. 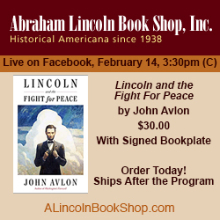 We’re going to head to Fort Stevens and we’re also going to visit President Lincoln’s Cottage at the Soldier’s Home, since the Johnson-Gilmor Raid had intended to try to kidnap Lincoln there. Time permitting, we may also try to visit the Confederate cemetery and memorial at Point Lookout State Park, since it was the ultimate objective of the Johnson-Gilmor Raid. Given all of that, it should make for a very interesting day indeed. “Today the entire Civil War community mourns the loss of a truly beloved figure. Every individual with more than a passing interest in Civil War history was aware of Deborah’s byline and knew it stood for quality reporting. Her monthly work with the Civil War News, and in numerous other publications, brought the Civil War alive for thousands of people. “Deborah was an absolutely wonderful person and a first rate journalist. I knew her, both personally and professionally, for almost a decade. I have the highest respect, not just for her journalistic professionalism and ability, but also for her as a human being. She was unfailingly fair and unbiased in her work, but still managed to let her passion for Civil War history and preservation come across in her writing. “Few people know that in addition to her writing career, Deborah also served on the staff of the Civil War Trust, one of CWPT’s predecessor organizations. Even once that tenure ended, Deborah continued to contribute to the cause of preservation in her own way. She was unflappable but also humble, and never sought credit for herself. Instead she strove to educate others about events she found important. Hands down, Deborah was the best and most important journalist on Civil War issues, especially preservation. The entire Civil War community is much the poorer for her passing. With 65,000 members, CWPT is the largest nonprofit battlefield preservation organization in the United States. Its mission is to preserve our nation’s endangered Civil War battlefields and to promote appreciation of these hallowed grounds. CWPT’s website is www.civilwar.org . Deb was a friend of mine. Last month, her husband, Bud Hall, was supposed to help me lead a tour of Kelly’s Ford, Brandy Station, and Culpeper, but what became the end stage of Deb’s very lengthy and very courageous battle with cancer began that week. For obvious reasons, Bud could not get away from Massachusetts; his place was with his wife, not on the battlefield with me. From what he told me then, I had a pretty good idea that this was not going to end well, and yesterday, when I got to the office, there was a voice mail waiting for me from Bud’s son, Brian, who is a ranger with the National Park Service. I’ve only met Brian once, and it was years ago, so I knew that there was only one reason for him to be calling me. Between her familiar and excellent journalistic work with Civil War News and her unwavering support of preservation causes, Deb was unique. She had the bully pulpit at her disposal and I cannot think of anyone who used it more effectively or more frequently than she did, constantly promoting preservation and making sure that it stayed in the public eye. The Civil War community, and, in particular, the battlefield preservation community, has lost a great friend in Deborah Fitts. Rest in peace, Deb. You deserve a rest after that long and terrible battle you just fought. However, as I wrote to Bud last night, I’ve never known anyone who bore the burden with the grace that you did, and I likewise have never known anyone to be so resistant to the idea of going quietly into that good night. And to her family, and, in particular, my friend and mentor Bud Hall, condolences and sincerest best wishes for your loss. As some of you may know, I was supposed to be a presenter at the annual conference of the Little Big Horn Associates (“LBHA”) this weekend. As I announced here, I changed my mind and elected not to participate. It’s high time that I explain why. It seems that the LBHA has a policy that it will not pay members to participate in its conferences in any fashion. That means no compensation, no travel expenses, nothing. Never mind that this is an organization with an endowment that surpasses six figures. The policy is that if you’re a member, they pay NOTHING at all. In short, the idea seems to be that they expect you to give your time and expertise for nothing. At least where I sit, it doesn’t work that way. That explains why, when I was asked to participate in their 2006 conference, which was held in Richmond, they made a membership in the organization part of the package: so they wouldn’t have to pay me anything. Of course, nobody explained that to me then. Rather, I thought it was standard operating procedure. I found out this spring that this idiotic and myopic policy in fact exists, and that they actually see nothing wrong with it. For me to attend their conference, I would have had to have given up two days in the office, totaling a couple of thousand dollars of lost billable time and about $400 in gasoline costs to get to and from Hagerstown. And I was supposed to do all of this for free. Here’s my policy: I am the one who chooses when I work for free when it comes to conferences and events like this. As just one example, I never charge battlefield preservation organizations or Civil War Roundtables for my time, typically only asking to have my travel expenses covered. For anything else, I expect to be paid for my time. I’m not saying I have to to be paid what I might otherwise bill if I were in the office, but it needs to be something to make it worth my while to come. Let’s remember that I live six hours away from Gettysburg and six hours away from Antietam, meaning that I pretty much lose two days just coming and going. And in this day and age of $4 per gallon gas, it ain’t cheap to come and go, either. This organization, which is beset with political woes that I won’t even begin to describe, evidently doesn’t believe that it’s worth paying presenters to appear unless they’re not members and have a high profile. Unfortunately, I renewed my membership this spring before I knew about this idiotic policy of theirs, meaning that under the policy, there was no chance of my getting paid. Had I known, I would not have renewed, and then I might have been able to force them to pay me. They likewise categorically refuse to reimburse travel expenses for members, either. Then there’s Ted Alexander. They wanted Ted to participate–which would have required either time off from the Park Service or his giving up a day off–and they weren’t going to pay him anything either, even though he’s not a member. When we heard that they were going to pay Jeff Wert to come speak (Jeff is not a member; obviously, there is no consistency in the enforcement of their stupid policy), we both a blew a gasket, and that’s when I decided to back out. There’s another issue to address. The current chairman of the board is a man named Bill Blake. Bill also was the one to put together this conference this weekend, so he’s the one I dealt with in discussing the event. Bill categorically refused to give Ted or me any guidance, instead insisting that we develop our own programs. We were supposed to talk about something related to Custer’s activities in the area, but got no guidance at all. There are lots of retreat from Gettysburg things in and around Hagerstown to discuss, but none of them have anything at all to do with the subject of the conference. Ted and I found the lack of any guidance incredibly frustrating. The subject of the conference this year is Antietam. Frankly, we can’t understand why. Custer was a staff officer who spent the day at the Pry House with McClellan. There’s nothing of interest there, but yet that’s the subject of the conference. Instead of asking Ted to lead the tour–he is the park historian there, after all–they hired a tour company with some guide we’ve never even heard of leading the tour. Ted was, quite rightfully, very offended by that, and I don’t blame him a bit. It’s worth noting that they’re paying for that, too. The combination of all of these factors is why I elected to remove myself from the lineup for the conference. And, as long as this idiotic policy remains in place, I won’t be participating in any more of their programs, either. Yesterday, I wrote about the A House Divided project at my alma mater, Dickinson College. As part of that discussion, I mentioned that my friend Brian Pohanka died of melanoma at the too-young age of 50. I have a first cousin named David. David was married to a pretty red head with very fair skin and lots of freckles. They had a swimming pool in their back yard, and his wife was very fond of laying by the pool, soaking up the sun. A freckle on her forehead turned cancerous and by the time they found it, it had metastasized to her brain. She died of melanoma very young, leaving three young sons (the youngest was six when she died). My parents’ next door neighbor also died of melanoma. She wasn’t smart about it. She knew she’d had skin cancers removed, but she categorically refused to stop laying out in the sun for hours at a time, and she ultimately paid for it with her life. As you can see, this horrible disease has touched me personally. This spring, it touched me in a different way. Those of you who regularly read this blog know what a huge, long-time fan I am of Bruce Springsteen and the E Street Band. My love for Bruce and his band dates back more than 30 years. On March 24, Susan and I attended his concert here, and his long-time bandmate and keyboard player, Danny Federici, was missing. Although his replacement, Charles Giordano, is a fine player, Danny’s unique sound and presence were definitely missing that night. Four weeks later, Danny was dead of melanoma. Like my cousin David’s wife, he had red hair, fair skin, and light eyes, and having grown up on the Jersey shore, he spent too much unprotected time in the sun. And it cost him his life. Yesterday, the E Street Band released a four-song EP of highlights from the Magic Tour, which is still going on in Europe. One of those songs is “Sandy”, which features a lengthy accordion solo by Danny that was his trademark. The version included in the EP was from Danny’s final performance with the E Street Band, less than a week before we saw them in March. 34 days later, Danny was dead at 58. Watching the video is a very moving thing; it’s painfully obvious that he was very, very ill, but it was also very obvious how happy his bandmates, and especially Bruce, were just to have him there on stage with them. All of the proceeds of the sale of this EP are being donated to the Danny Federici Melanoma Fund with no royalties being paid to anyone, including by Apple. I bought all four songs plus the video of “Sandy” yesterday. The whole thing cost me $6.00. Even Sen. John McCain, who could be the next President of the United States, has been treated for melanoma on several occasions. Nobody is exempt. This is a very worthy cause, and I want to encourage you to open your hearts and your wallets. We’ve already lost too many good people to this disease. Let’s do what we can to try to find a cure. Thank you. My regular readers know that I am member of Dickinson College’s 210th graduating class, otherwise known as the Class of 1983. Some of you may also know that my friend and mentor Brian Pohanka was also an alumnus of Dickinson College. Brian was a member of the Class of 1977, although I didn’t come to know Brian until well after both of us had left Carlisle. When it became obvious that the melanoma that took Brian’s life had returned and that things were looking bleak, Brian’s family decided to honor his life and dedication to history by endowing the Brian C. Pohanka Chair of Civil War History at Dickinson. Brian, in very typical fashion, felt it was “unseemly” (to use his word) to have such a memorial to someone who was still alive, and refused to permit the position to bear his name while he was still alive. Consequently, it was called the Dickinson College Chair of Civil War History until after his death. I was one of the few outside of the family and outside of the college administration to know about it, and I was sworn to secrecy. I respected my friend’s wishes and didn’t say anything about it until after Brian passed. With Brian gone, the name was then changed. Prof. Matthew Pinsker was hired in 2002 to fill the position, and he has done so quite well. For those not familiar with Matt’s work, he is one of the brighter lights in the younger generation of Lincoln scholars, and Dickinson is fortunate to have a historian of his caliber filling the position. The College has launched a wonderful project called A House Divided: The Civil War Era and Dickinson College, an on-line archive of information about my alma mater’s many contributions to the Union and Confederate armies during the Civil War. The project, under Matt’s direction, is still being developed and is still in the beta testing stage, but there’s some really useful and interesting information to be found there. And best of all, the dedication page on the web site says, “The House Divided website is dedicated to the memory of Brian C. Pohanka (Class of 1977).” I think Brian would be pleased. It’s a wonderful and worthy tribute to his memory and his life’s work. For some time, I’ve been toying with the idea of researching and writing about Dickinson’s contributions to the Civil War–for some reason, an unusual number of Civil War cavalry officers were Dickinsonians–so I contacted Matt to discuss the idea. Matt has suggested that my idea be folded into A House Divided, an idea that I wholehearted embraced. It will be my honor and my pleasure to be a contributor to the project, and it will give me a way to honor the memory of my friend. I commend the site to you, even though it’s still in the beta phase, and hope you find it interesting.